UPDATE The Weston Elementary cancer story continues to find its way into new and bigger media outlets including the London Daily Mail. The parents have rallied around and referenced an engineer, Eric Windheim, whom they hired whose credentials were examined and critiqued in Inside Towers’ Thursday story “Are School Parents Getting the Wrong Info From EMF’ers?” Last Thursday, CBS This Morning aired “Cell tower behind cancer scare at 1 school?” The parents, understandably teary eyed over their respective sons’ unexplained illnesses, were juxtaposed with pictures of the site which Sprint has since agreed to remove. CBS talked to Sprint’s Network Project Manager Dharma Nordell who said three tests have shown the tower is operating 100 times below the federal limit. new report from telecom research firm Analysys Mason, which conducted the analysis on behalf of CTIA. Lawmakers in Congress introduced legislation to prevent contraband cell phone use in prisons. The measure sponsored by Senators Tom Cotton (R-AR), along with Senator Lindsey Graham (R-SC), allows state and federal prisons to use cell phone jamming systems. Representative David Kustoff (R-TN) and William Timmons (R-SC) introduced companion legislation in the House. A bi-partisan group of Senators introduced a bill to prevent the federal government from nationalizing 5G and deploying its own network. Two advisors to the President, Karl Rove and campaign manager Brad Pascale, are among “several high-profile” supporters of a government-backed plan to have the federal government manage the sharing of 5G airwaves with wireless providers, reports Politico. White House economic adviser Larry Kudlow does not support the effort. Rove has been calling congressional offices to warn against bipartisan efforts to ban the nationalizing of 5G, according to the account. The drama over the advertising industry’s first 5G case continues over an issue that has repercussions in how the industry presents next-generation services to consumers. The National Advertising Division (NAD), an investigative unit managed by the Council of Better Business Bureaus, asked Verizon to stop claiming it has the country’s first 5G network. Verizon is appealing the decision and claims its commercials are not misleading, reports arstechnica. UPDATE Citing recent activity by parents in Ripon, CA who got a tower removed from school property due to cancer concerns, parents at the Montessori del Mundo charter school in Aurora, CO are requesting radiation tests from T-Mobile, according to the Aurora Sentinel. Like their California counterparts, they’re concerned that cell phone antennas on the school’s roof could cause cancer or pose other health risks to their children and other students despite reassurances of safety. The FCC’s broadband coverage maps have long been maligned by the agency’s own Commissioners, Congress, and others for being inaccurate, and not a reliable indicator of where broadband has been deployed and where connectivity is non-existent. But carriers and the government need to rely on the maps to direct federal broadband funding. That’s why USTelecom, The Broadband Association, ITTA, The Voice of America’s Broadband Providers, the Wireless Internet Service Providers Association, and several broadband companies and associations unveiled on Thursday, the creation of a new initiative to better map broadband deployment nationwide and help close the digital divide. Tennessee Governor Bill Lee Tuesday revealed $14.8 million in broadband accessibility grants that will expand broadband service to more than 8,300 households and businesses in 17 counties. Experts say the TV channel repack is getting more complicated as winter drags on and delays are inevitable, coming into spring and summer. Phase 1 ended in late November with 143 stations moving without much delay, Inside Towers reported. However winter weather has caused headaches for tower crews and delays in Phase 2, with about 114 station moves due to be completed by April 12, reports TVNewsCheck. In addition, many of the stations in the middle phases have interference dependencies, meaning if a station in Phase 3 moves late, that delays a move for another station in Phase 4. By contrast, there were no interference dependencies in Phase 1. Stations facing delays were simply moved to a later phase, said Dennis Wallace, Managing Partner of RF consulting firm Meintel, Sgrignoli & Wallace, LLC. “You had a year and a half to move 150 stations,” says Wallace. “Now you’re going to move 150 every 30 to 60 days, which I think is pretty unrealistic. I think the wheels come off the wagon here in Phases 3 and 4,” he tells TVNewsCheck. More than 80 percent of 911 calls today are made from wireless phones. The FCC has been modernizing its 911 location accuracy rules, and Friday proposed updating them to make it easier to locate callers in multi-story buildings. The proposal would help 911 call centers identify the floor level where the call originated. The debate grew spirited at times, and vote split along party lines. A landline automatically sends data containing the caller’s address to 911. Callers expect the same kind of accuracy when they use a cell phone to call 911. The FCC’s Enhanced 911 location accuracy rules, require wireless providers to meet an increasingly stringent series of location accuracy benchmarks, including providing the caller’s “dispatchable” location (such as the street address and apartment number), or a vertical location on a phased-in basis, beginning in April 2121. Inside Towers will be entering the world of podcasting, with an ongoing series of talks and “Fryerside Chats,” featuring guests from across the industry. Inside Towers Managing Editor, Jim Fryer, hosts the program slated to run, initially, twice per month. Tower Talks’ first guest is Todd Schlekeway, Executive Director of NATE. Schlekeway discusses the recent NATE conference and the upcoming ‘D.C. Fly-In’ held for NATE members, looking to connect with their political representatives. Fryer also shares the ethernet with Inside Towers Washington Bureau Chief, Leslie Stimson, who provides insights on what is happening “inside the Beltway” with both the FCC and Congress. In a prepared statement, board president Kit Oase said tests done on the tower found it was operating normally within safety standards. Additionally, Oase noted that RUSD receives a negligible amount of revenue from providing campus space for the tower. In a nearly two and a half-hour hearing Tuesday that turned contentious several times, lawmakers on a House Judiciary Committee subcommittee tried to parse whether the proposed merger of T-Mobile and Sprint is in the public interest. Full Judiciary Committee Chair, Jerry Nadler (D-NY), said, “We must determine if a combined company would have less incentive to innovate and compete with competitors” in an already “highly concentrated” market. The resulting three large carriers would each have a third of the market, he added. In February 2015, Arlington officials spent $4.1 million to build a 10-mile fiber optic “ConnectArlington” network, aimed at giving local businesses cheaper access to higher-speed internet by offering an alternative to the large ISPs; however, since then, the fiber has gone almost totally unused, reported ARLnow. Though the county is barred by state law from offering internet service itself, officials envisioned smaller ISPs working with local tech firms to “light” the fiber, providing county businesses with a new option to access the internet at fast speeds. According to a committee of broadband experts, the program design scared off businesses interested in leasing the fiber. Eight months ago, the committee presented a report recommending an extensive overhaul of the program’s design. County officials say they’re already working to heed some of the committee’s recommendations, but it remains an open question as to how the county will work to address the problems with ConnectArlington. The network costs hundreds of thousands of dollars per year to maintain, reported ARLnow. Facebook plans to build a fiber optic network from Ashburn, VA to Columbus, Ohio to connect two major internet exchanges. The work is expected to begin this year, and last between 18 to 24 months. U.S. Senator Shelley Moore Capito (R-WV) and West Virginia Governor Jim Justice said about 275 miles of the route will be in West Virginia, providing the state with enhanced fiber optic connectivity. 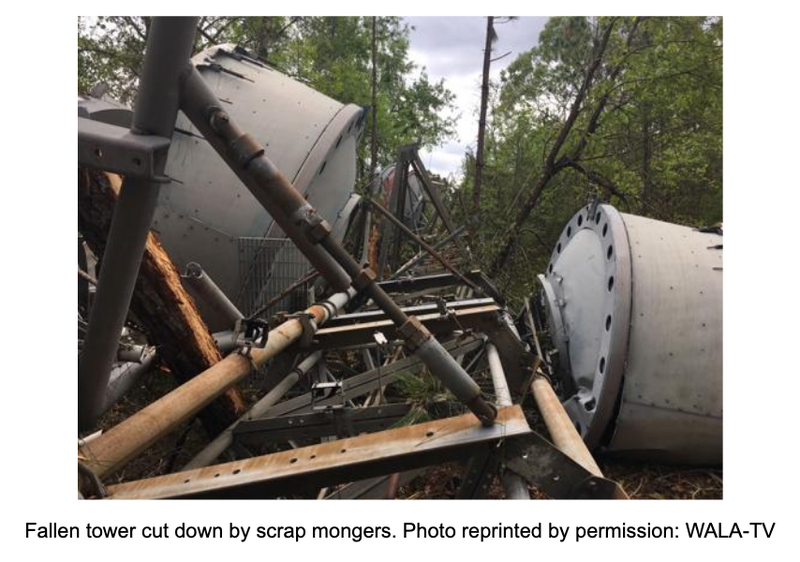 It was no contest for a 250-foot tower in Smith Station, AL Sunday night, when a tornado ripped through Lee County, taking down the latticed structure located along Highway 280. The National Weather Service said the twister was at least EF-3 in strength with winds of 136-to-165 mph and was a half-mile wide or more. Are Security Fears About Huawei Overdone? Some security experts believe U.S. claims about the potential danger Chinese telecom Huawei poses to 5G networks are overblown. Huawei, meanwhile, has gone on the offensive to repair its image. The security issue relates to the U.S. extradition case against Huawei’s CFO. Canada is allowing the case to proceed. Huawei took out a full-page ad in Thursday’s Wall Street Journal that read: “Don’t believe everything you hear. Come and see us.” The ad, an “open letter” from Catherine Chen, a senior vice president and director of Huawei’s board, asks U.S. journalists to visit the company’s campuses, noting the U.S. government has accused the company of espionage, fraud and theft in the past year, and “has developed some misunderstandings about us,” reported CNBC.